Add some fire to your mix with these 3 fiery red shades (R) with gorgeous translucence and rich reflects. They're ideal for adding controlled copper tones to your warmer mixes or putting a bit of rich, yet subtle, red into a grey coverage formula. Colour is long lasting too, thanks to Colorly's ACP Complex molecule which mixes anti-oxidants like melanin and wasabia japonica with conditioners like wheat germ oil. The result is beautifully conditioned hair and colour that's protected from UV fade. 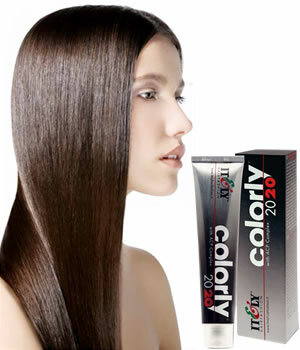 For best results, Colorly 2020 should be mixed 1:1 with Oxily 2020 peroxide at the appropriate strength. Development time is simply the volume of developer + 10 (e.g. 40 vol processes in 50 mins). Colorly 2020 comes in 60-ml tubes. Buy any 7 It&ly Colorly 2020 tubes for the price of 6, taking the average price down to a pocket-pleasing £3.42 per tube!! Essential tint set and hair clips in delectable pink and supplied in a pink-edged PVC carry bag. Contains: tint bowl and standard tint brush, measuring jug, 2 x butterfly clips and 2 x sectioning clips. 1 pair of superb re-usable latex gloves with an inner lining that makes them easy to put on and remove and comfy to wear. Chocolate brown in colour and available in 4 sizes.